Introduction: So What Kind of Rifle Is This? Verney-Carron are famous for their superb double rifles which feature an innovative double under-locking system that obviates the need for a top extension, and thus leaves the breech completely uncluttered for reloading. Owners of these rifles I’ve met seem very happy with them and watching them in action the rifles function flawlessly. But whilst being famous for their double rifles Verney-Carron are a company who apply “out of the box” design thinking to their other rifles, and their Speedline “Stop & Go” sporting rifle is one that defies placement in one of the types we are all familiar with. Is it a pump? A lever action? A semi-automatic? A straight pull? No, none of these. The Speedline is best described as an “auto-ejector rifle”, and while there haven’t been many such rifles created it actually isn’t a new concept, and its predecessor was a humble single shot auto-ejector .22 rimfire rifle by Harrington & Richardson. The old Harrington & Richardson 755 Sahara single-shot auto ejector .22 rimfire uses the same basic design principle as the Verney-Carron Speedline. (Picture courtesy thefirearmsforum). To use the Harrington & Richardson 755 Sahara single-shot the shooter first pulled the bolt back, inserted a cartridge in the chamber, and closed the bolt. As the rifle was a single-shot .22 Short, Long or Long Rifle cartridges could be used. When the rifle was fired the bolt would blow back and eject the fired cartridge case. This left the bolt in the rearward position so the shooter could then chamber another cartridge, close the bolt, and then fire again. These were a great training rifle for new shooters because they simplified the loading process and automatically returned to an open bolt, and clearly safe condition when fired. The Verney-Carron does essentially the same thing, but has a magazine, and uses a spring loaded bolt that is allowed to close only if the lever at the side of the action is pressed. The advertisement video below from Verney-Carron shows this in action. The Verney-Carron Speedline “Stop & Go” rifle is made in centerfire rifle calibers; .300 Winchester Magnum, 30-06 Springfield, 7mm Remington Magnum, and the popular European 7x64mm which was created by Wilhelm Brenneke (the same man who invented the Brenneke shotgun slug). The rifle features a box magazine and magazines are available in 3 round and 5 round capacities. To fire the Speedline the bolt must first be closed. This is done by pressing the lever on the side of the action which releases it to fly closed under spring pressure. To operate the Speedline the action is opened by use of the handle on the side of the bolt: this locks the bolt in the open position. The removable box magazine is then loaded with cartridges and inserted into the rifle. When the shooter is ready to fire they press the lever on the side of the action which causes the open bolt to fly forward stripping a cartridge from the magazine, chambering it, and causing the six lug bolt head to rotate into battery, locking into recesses in the barrel. When the shooter wants to fire the trigger is depressed and the hammer falls on the firing pin causing the cartridge to discharge. When the cartridge discharges the gas behind the bullet projects the bullet through and out of the barrel, as it does this a vent in the barrel uses some of the gas pressure to act on a piston which sends the bolt backwards, ejecting the fired cartridge case. As the bolt reaches its rearmost position it is held there, keeping the action safely open, until the next shot is required. If no further shot is required the magazine can be removed rendering the rifle safely and visibly unloaded with the bolt open and the breech visible. The safety catch is a cross-bolt type located at the rear of the trigger guard. Verney-Carron Speedline action. The safety catch is a conventional cross-bolt type. The magazine releases are on either side of the magazine well. One of the safest of all rifle and shotgun actions is the pump, and the Verney-Carron Speedline provides exactly the same level of safety, which makes it a very neat design. The shooter has complete control over when the action is closed and made ready to fire. Similarly the rifle can be carried with the action open if the shooter prefers that yet it can be put into action with the simple press of a button. How Fast Is This Rifle to Use? 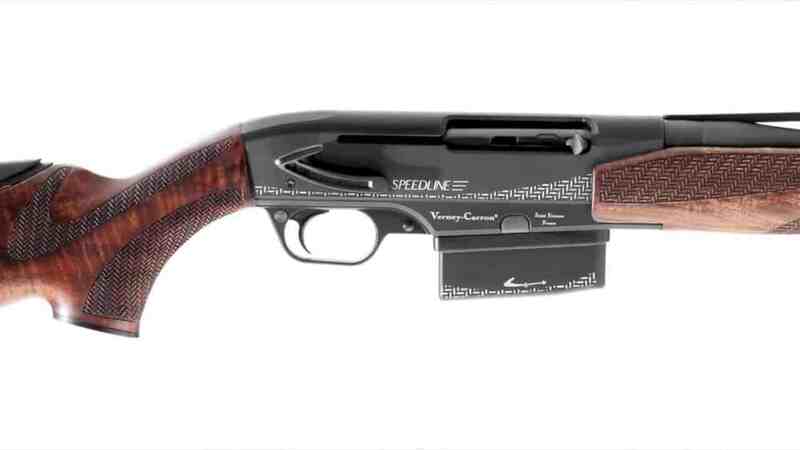 In addition to providing a high level of shooter control the Verney-Carron Speedline has been designed to permit quick follow-up shots if required, such as would be needed in a driven game shoot or a vermin control/culling operation. The Speedline does provide for quick convenient repeat shots, but it is certainly not like a semi-automatic. In order to fire a repeat shot the shooter must move their thumb across the action to reach the bolt-release button. This can be done quite quickly, but I don’t think it offers greater speed than a lever action or a pump action. In fact I’d go so far as to suggest that if a shooter with a Speedline took on a guy with a hundred year old First World War Lee Enfield bolt-action in a “Mad Minute” match that the shooter with the Lee Enfield would quite probably win. There certainly wouldn’t be much in it. That being said, the Speedline is a rifle you would buy if you were looking for a modern, well balanced, ergonomic rifle which provides for a fast follow-up shot or two in the deer woods. The Speedline is made in both right-hand and left hand models so “southpaws” are fully catered for. This makes the Speedline one of the better rifles for left handed shooters. The left handed models are only available in .30-06 and .300 Winchester Magnum however. The Speedline models feature quick acquisition open sights with a Battue rib being optional. The rifles feature an adjustable comb secured with three supports. The receiver is alloy which keeps the overall weight of the rifle down whilst not compromising strength as the six lugs on the bolt lock directly into the barrel, making this a strong front locking action. The action is enclosed providing an extra measure of safety. The alloy receiver is drilled and tapped for riflescope mounts and the mounting holes in the receiver have a steel insert. Rifle weight is around 3.15kg without muzzle-brake or optical sights fitted. Stock wood is walnut and sling swivels are fitted. Barrel length is 21.6″/ 55cm without muzzle-brake. The Speedline can be ordered with optional extras such as a personalized pistol-grip cap, additional magazines (3 shot or 5 shot), mounts and/or rails for optical sights. The Speedline Classique is the standard model. Speedline Classique right handed model. Verney-Carron Speedline Bête Noire left handed model. The Speedline Bête Noire is a more luxurious model featuring game scenes of running wild boar on the action sides. Verney-Carron Speedline Bête Noire right handed model. Verney-Carron Speedline Gator limited production model. The Verney-Carron Speedline Gator is a limited production model featured in the 2018 catalog. 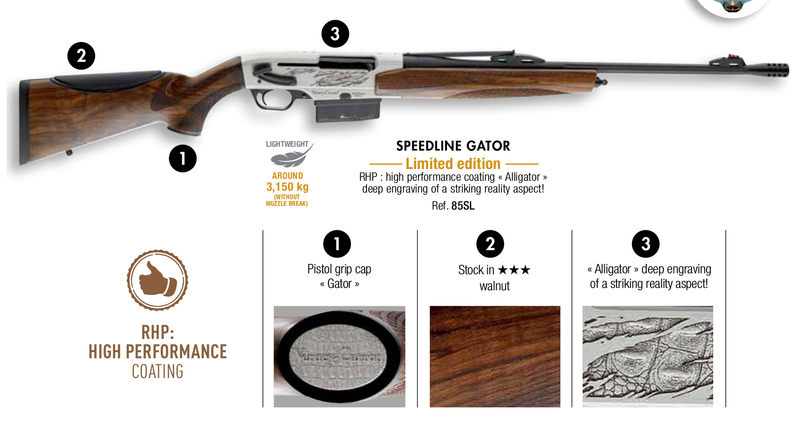 It has Alligator engraving on the action sides and a special feature pistol-grip cap. The Verney-Carron Speedline is an interesting and very efficient design, well made and finished. It would be a great rifle for the deer woods being relatively light and fast handling, and having a significant long range advantage if the area you are hunting in provides longer range opportunities. The rifle’s strengths are its very safe action which puts the shooter totally in control, and the speed with which a repeat shot can be made. Not only that but because the action uses some of the energy generated in firing to drive the bolt back there is a distinct reduction in recoil: something that makes shooting the .300 Winchester Magnum quite comfortable for example, and the recoil of the 30-06 should be as gentle as a maiden’s caress in one of these rifles. The Verney-Carron Speedline is one of very few automatic-ejector rifles ever made. It is arguably the best of them: a bold concept, well executed. You will find the Verney-Carron 2018 catalog in English if you click here. You will find the Verney-Carron website if you click here. (All pictures courtesy Verney-Carron except as otherwise marked).